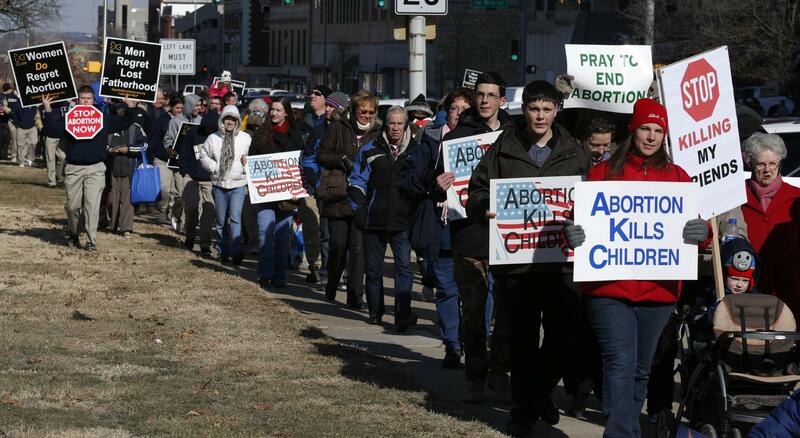 Abortion opponents march to a rally at the Kansas Statehouse in Topeka, Kan., on the 40th anniversary of Roe v. Wade. Kansas is among several states that have enacted new restrictions on abortion in recent years. South Dakota is one such state. On a busy thoroughfare in Sioux Falls, a dusting of snow surrounds a small brick building that houses a Planned Parenthood clinic. Inside, clinic staff are using informed consent procedures now mandated by state law. In one room, a nurse and patient quietly discuss the pages of forms required before an abortion can be performed. With the end of one legal challenge here, a mandatory 24-hour waiting period for an abortion is about to increase to 72 hours. The law says a woman must be allowed to see an ultrasound and that the doctor must record any response. A doctor is also required to read a statement saying abortion causes an increased risk of suicide — a claim that abortion-rights groups say is not supported by medical evidence. The doctor must also tell patients that an abortion will "terminate the life of a whole, separate, unique, living human being." "It's language that is designed to demean and degrade and shame a woman," says Sarah Stoesz, president and CEO of Planned Parenthood of Minnesota, North Dakota and South Dakota. "The situation in that state is becoming increasingly more difficult." The group is battling legislation that it says is intended to intimidate women. The latest flashpoint is a provision requiring patients get counseling from crisis pregnancy centers that oppose abortions and try to discourage them. "We will never give up on that, because it is so heinous and it is so degrading and it is so wrong to put a woman in that position," Stoesz says. Several crisis pregnancy centers in Sioux Falls would not provide anyone to discuss the requirement. In part, the law says the centers will assess the mother's health and judge whether she is being coerced into having an abortion. "What the state is trying to do is to ensure that the mother has an informed decision," says Mary Spaulding Balch, who monitors and directs state legislation for the National Right to Life Committee. "They're not banning the abortion, but they certainly can make sure that, prior to making this life-and-death decision, that the mother knows the full and complete consequences of that decision." A movement to impose the requirement has momentum in the states, where a growing number of legislatures are passing restrictions. The laws — more than 130 in the past two years alone, according to the Guttmacher Institute, which studies abortion in the U.S. — include stronger informed consent measures, parental notification, ultrasound requirements and clinic regulations. In addition, more than a half-dozen states now restrict abortion after 20 weeks, based on the theory that fetuses can feel pain. Four decades after Roe, five states, including Mississippi, North Dakota and South Dakota, have just one clinic that performs abortion. Spaulding Balch says those laws reflect the will of their citizens. "The states reflect the people more closely, and they have an ability to respond to what the people in the state thinks is reasonable," she says. After four decades, both sides say they have the support of the American people. National Right to Life points to a 2012 Gallup poll that shows half of those surveyed identify themselves as "pro-life versus pro-choice." But abortion-rights groups say that same poll shows more than 3/4 of Americans think abortion should be legal in some or all circumstances. Another focal point in the abortion debate has been Wichita, Kan., where second- and third-trimester abortions were performed for years at a clinic owned by Dr. George Tiller. An avowed abortion opponent murdered Tiller in 2009, and the clinic has remained vacant since then. Now, abortion-rights activists are trying to reopen it. Julie Burkhart, who ran Tiller's political action committee in Kansas, says she formed the Trust Women Foundation to find doctors willing to perform first-trimester abortions in Wichita, a city that is divided on the issue — and that has been without an abortion provider for 3 1/2 years. "We did a lot of soul searching," Burkhart says. Her group decided that, to honor Tiller and the women who live in the area, it needed "to re-establish abortion care, which we are doing with a new model of practice. We will be offering full spectrum OB-GYN care." Burkhart says she has found three out-of-town doctors willing to come to Wichita and expects the clinic to open within two months. Tiller had recognized that regulations might be passed to try to close the facility, so he built large operating rooms and wide hallways similar to what you might see in a minor emergency center. Regulations requiring clinics to meet those standards did eventually pass in Kansas and are now in court. Abortion-rights activists see reopening of the clinic as a bright spot in the abortion debate, but those opposed to abortion vow to do everything they can to keep it closed. David Gittrich, state development director for Kansans for Life, started a petition drive to persuade the city to rezone the area. "We need to continue being pro-life until we reverse the Roe v. Wade decision and have opportunity to make it illegal in our state and in other states," Gittrich says. "Things don't change and get solved unless you're in the race for a long haul." But after so many years bickering about the laws and the social divide, Planned Parenthood's Stoesz says the issue is about not only abortion but how women feel about their autonomy and what's best for their families. Stoesz adds that she'd like to see real dialogue and common ground on issues like reducing the need for abortion and ending child hunger. But with the two sides so far apart, the question remains whether they can engage in any real discussion. "I just think the country is tired of this," Stoesz says of the ongoing divide. "It's been 40 years since Roe and people want to move on." Today marks the 40th anniversary of the U.S. Supreme Court decision that legalized abortion. Thousands of activists on both sides of the issue are holding rallies this week at state capitals across the country. Kansas Governor Sam Brownback, who opposes abortion, spoke before a crowd in Topeka today. GOVERNOR SAM BROWNBACK: Keep marching. Keep moving. Keep fighting for life. SIEGEL: Since Roe v. Wade, abortion has been one of the most debated and legislated issues in the nation. As NPR's Kathy Lohr reports, state legislatures have become key battlegrounds in the fight as many are now passing laws to restrict access to the procedure. KATHY LOHR, BYLINE: In Sioux Falls, South Dakota, a bit of snow surrounds a small, tan brick building along a busy thoroughfare that houses a Planned Parenthood clinic. The staff now uses informed consent procedures mandated by state law. UNIDENTIFIED WOMAN #1: All right, dear. So did you get a chance to read through all of this? UNIDENTIFIED WOMAN #1: Did you have any questions on it at all? UNIDENTIFIED WOMAN #2: No questions. LOHR: A nurse and patient discuss pages of forms required before an abortion. With the end of one legal challenge here, a mandatory 24-hour waiting period is about to increase to 72 hours. The law says a woman must be allowed to see an ultrasound and that the doctor must record any response. And there's more. LOHR: A doctor must read a statement saying abortion causes an increased risk of suicide, a claim that abortion rights groups say is not backed by medical evidence. The doctor must also tell patients that an abortion will, quote, "terminate the life of a whole, separate, unique, living human being," unquote. SARAH STOESZ: It's language that is designed to demean and degrade and shame a woman. The situation in that state is becoming increasingly more difficult. LOHR: Sarah Stoesz is with Planned Parenthood of Minnesota, North Dakota and South Dakota. The group is battling legislation that it says is intended to intimidate women. The latest flashpoint is a provision that requires patients to get counseling from crisis pregnancy centers that oppose abortions and try to discourage them. STOESZ: We will never give up on that because it is so heinous and it is so degrading and it is so wrong to put a woman in that position. LOHR: Several crisis pregnancy centers in town would not provide anyone to talk about the law. In part, it says the centers will assess the mother's health and judge whether she is being coerced into having an abortion. Mary Spaulding Balch monitors and directs state legislation for the National Right to Life Committee. MARY SPAULDING BALCH: What the state is trying to do is to ensure that the mother has an informed decision. They're not banning the abortion, but they certainly can make sure that prior to making this life-and-death decision that the mother knows the full and complete consequences of that decision. LOHR: The movement has momentum in the states where more are passing restrictions. The laws, about 130 in the past two years alone, include stronger informed consent measures, parental notification, ultrasound requirements, clinic regulations. And more than half a dozen states now restrict abortion after 20 weeks based on the theory that fetuses can feel pain. Four decades after Roe, five states including Mississippi, North Dakota and South Dakota have just one clinic that performs abortion. Again, Mary Spaulding Balch with the National Right to Life Committee. BALCH: The states reflect the people more closely, and they have an ability to respond to what the people in the state thinks is reasonable. LOHR: After four decades, both sides say the American people back them. National Right to Life points to a recent Gallup poll that shows half of those surveyed identify themselves as quote, "pro-life versus pro-choice." But abortion rights groups say that same poll shows that more than three-fourths of Americans think abortion should be legal in some or all circumstances. Another focal point in the abortion debate has been Wichita, Kansas, where second and third trimester abortions were performed for years at a clinic owned by Dr. George Tiller. An avowed abortion opponent murdered Tiller in 2009 and his clinic has remained vacant since then. Abortion rights activists are now trying to re-open it. JULIE BURKHART: Here we have the operating rooms, and we have our sterile and soiled rooms there. LOHR: Julie Burkhart ran Tiller's political action committee in Kansas and says she formed the Trust Women Foundation to find doctors willing to perform first-trimester abortions in this city that's been so divided and has been without an abortion provider for three and a half years. BURKHART: We did a lot of soul searching and decided that what we needed to do in this part of the country in order to honor him but also to honor the women who live in this area was to re-establish abortion care, which we are doing with a new model of practice. We will be offering full-spectrum OB-GYN care. LOHR: Burkhart says she's found three out-of-town doctors willing to come to Wichita, and the clinic is expected to open in the next couple of months. Tiller recognized regulations might be passed to try to close the facility so he built large operating rooms and wide hallways, similar to what you'd see in a minor emergency center. Regulations requiring clinics to meet these standards did eventually pass in Kansas and are now in court. Abortion rights activists see re-opening the clinic as a bright spot in this debate, but those opposed to abortion vow to do everything they can to keep it closed. David Gittrich with Kansans for Life started a petition drive to convince the city to rezone the area. Volunteer Beverly Klag stops by for a moment to drop off the latest batch of petitions. GITTRICH: Wow, nice. Thank you very much. KLAG: I think there's 174 signatures there. LOHR: Gittrich and others who oppose abortion say they'll keep fighting. GITTRICH: We need to continue being pro-life until we reverse the Roe v. Wade decision and have opportunity to make it illegal in our state and in other states. Things don't change and get solved unless you're in the race for a long haul. LOHR: But after so many years bickering about the laws and the social divide, Sarah Stoesz with Planned Parenthood says the issue is not only about abortion, but about how women feel about their autonomy and what's best for their families. STOESZ: I just think the country is tired of this. It's been 40 years since Roe and people want to move on. LOHR: Stoesz says she'd like to see real dialogue and common ground on issues like reducing the need for abortion and ending child hunger. But the question is whether two sides are too far apart for any real discussion. Kathy Lohr, NPR News. Transcript provided by NPR, Copyright NPR.